This is a chasuble, the vestment worn by a Catholic priest when celebrating the mass. Prior to the 1960s, the priest stood facing the altar so the back of the chasuble was visible most of the time. This may account for the beautiful construction of the back and the rather less refined construction of the front. On the back, the embroidered orphreys (decorative bands) have been attached to two pieces of red brocaded silk so that the gold camels in the pattern march across the textile horizontally, flanked by flowers and foliage. The most elaborate embroidered motifs are also on the back – the Crucifixion, biblical and saintly figures, and two shields or coats of arms bearing the personal devices of Sir Thomas Erpingham: an eagle rising and the red rose of Lancaster. Erpingham (about 1375–1428) was a close associate of Henry IV and Henry V and a veteran of the Battle of Agincourt (1415). The chasuble may have been for his personal chaplain, or for a church with which he was connected. The silk was probably made in Italy; the embroidered orphreys were probably made in England which was renowned for high quality needlework of this type (often called 'opus anglicanum', literally 'English work'). The high cost of the materials may explain why the front of the chasuble has been put together from small pieces of the silk. The chasuble has been reduced from its original 'bell' shape cut to suit the more fashionable 'fiddle' shape of a later period (in or after the 17th century). Precious silk and fine embroidery, especially containing metallic threads, were used economically, and were often recycled. Chasuble, stole and maniple of brocaded silk lampas, embroidered with silk and silver-gilt threads. On the advice of the Keeper of Paintings of the National Museum of Wales, G.A. Coxhead, Bursar of Blackfriars School (of which the Dominican Council was the trustee), Llanarth, Raglan in Monmouthshire approached Donald King about the identification and value of three chasubles in June 1967. 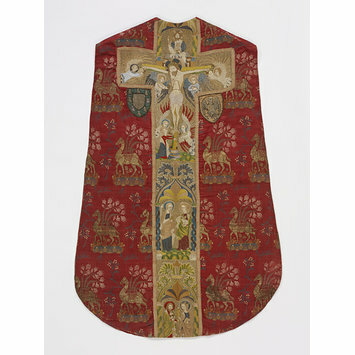 The Erpingham chasuble was one of these, the one most highly prized by King who described it thus: 'Red brocade set. The chasuble, stole and maniple (chalice veil and burse are wanting) are made from Italian brocaded silk of the early 15th century; the orphreys on front and back of the chasuble are English embroidery of the same period. The chasuble has been mutilated at a later date, and the embroidery is somewhat disfigured by modern restoration, but this is an interesting early vestment. The Museum is prepared to purchase the set for the sum of £800' (King to Father Cyril Hodsell, 19 July 1967). The museum also purchased a red satin set (T.257 to B-1967 and T.258&A-1967), and suggested the Whitworth Art Gallery as a possible home for the white damask set. King wrote in 1968 (p. 59) that the chasuble was 'Said to have been for many years in the possession of a Catholic family in Monmouthshire' (King 1968, p. 59). Historical significance: The chasuble is significant as an example of the finest craftsmanship in textiles. 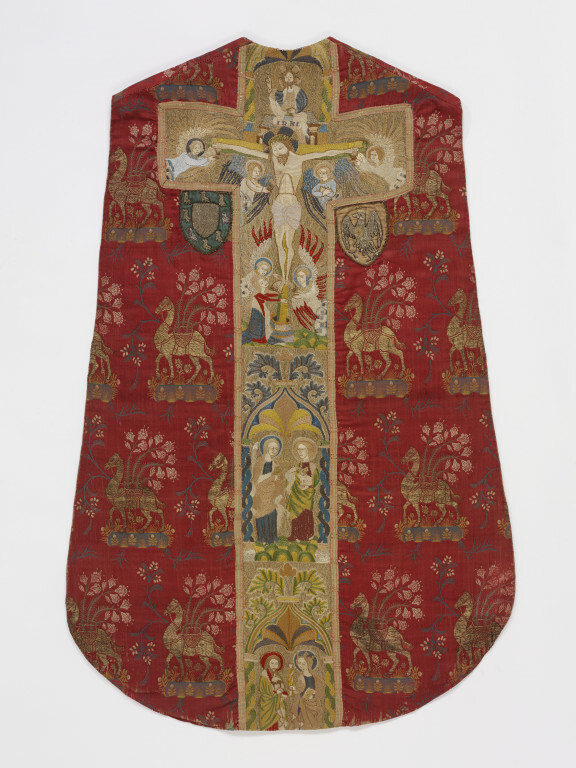 In the service of the Catholic Church, the maker of this chasuble combined imported silks from one of the premier centres of European silk-weaving with the finest professional embroidery made locally. The coat of arms identifies the likely patron, adding to the chasuble's historical interest as an example of the common practice whereby richly decorated church vestments bore the heraldic devices of the person who commissioned them. Attribution note: The coat of arms on the back suggests that this chasuble was made specifically for Sir Thomas Erpingham, possibly for his personal chaplain or for a church with which he was connected. The shape of the chasuble does not conform to the most common 'bell' shape typical of the period in which the silk and ophrey bands were made and the orphrey bands have been shortened, so it is likely that the chasuble was cut into this form at a later date. The chasuble is an example of the richly decorated church vestments commissioned by wealthy donors or patrons for use in the Church. This particular example is typical of the International Gothic style favoured in the late fourteenth and early fifteenth centuries, the silk characterised by the oriental/exotic motif of gold camels bearing flower baskets. The orphreys, in contrast, come from an English tradition of fine needlework (opus anglicanum), so famed in the thirteenth and fourteenth centuries that it was sought by the most powerful rulers and churchmen of Europe. The combination of secular and ecclesiastic imagery is not unusual in vestments, the silk being suitable for both secular and ecclesiastical use, the iconography of the embroidered orphreys being specifically ecclesiastical and the coats of arms secular. Although the chasuble cannot be identified among the records of the many vestments that Sir Thomas Erpingham gave to Erpingham (Norfolk) and other churches, it may have been made for his personal chaplain or for a church with which he was connected. His taste for Italian silks may have been formed on travels in Italy. Paul Williamson. The Mediaeval Treasury: the Art of the Middle Ages in the Victoria and Albert Museum, 3rd edition. London, 1998, pp. 230-231, col. pl. 23. A chasuble was worn by the priest celebrating the Mass. This one bears the shield of arms and personal device of Sir Thomas Erpingham. He was a close associate of Henry IV and Henry V and a veteran of Agincourt. The chasuble may have been for his personal chaplain, or for a church with which he was connected. The silk woven in Italy, the embroidery executed in England, the chasuble probably made in England.